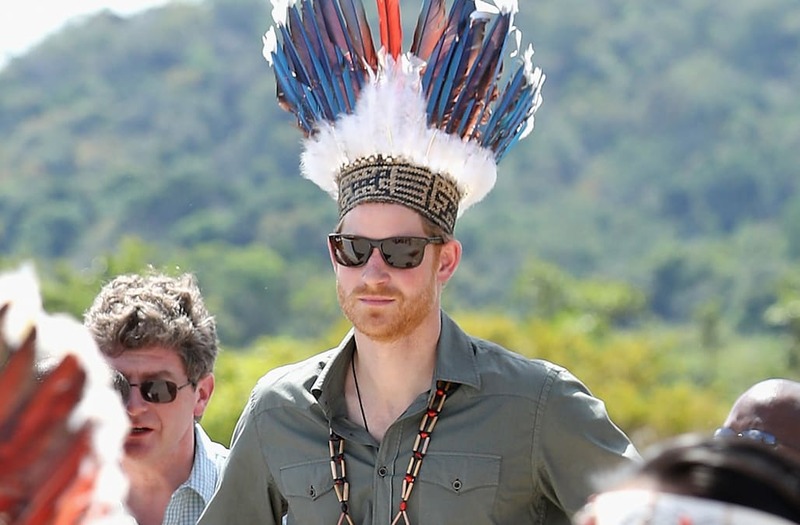 Prince Harry knows how to work good headdress. The 32-year-old royal proudly sported the feathered piece, presented to him by dancers in a Surama Village in Guyana, on Saturday, on the final leg of his Caribbean tour. Harry impeccably modeled the red, white and blue headdress -- the colors of the British flag -- with his hands on his hips, accessorizing the look with Ray-Ban sunglasses. While Harry displayed his British pride in the Caribbean, his girlfriend, Meghan Markle, seems to have passed down a little U.K. love to her dog, Guy. "For the love of hand-me-downs. This was Bogart's sweater when he was a puppy, and now it's keeping Guy warm. #puppylove #adoptdontshop #reducereuserecycle," she captioned the cute pic. RELATED: Rihanna and Prince Harry Take HIV Tests Together on World AIDS Day -- Watch! Harry has been traveling the Caribbean on behalf of Queen Elizabeth II, and earlier this week, made a stop in Barbados, where he hung out with Rihanna. See the stars' meeting in the video below.